Raumfahrt+Astronomie-Blog von CENAP - Blog: Astronomie - Gab es ein Alien-Funksignal von sonnenähnlichen Stern HD 164595 ? SETI researchers are buzzing about a strong spike in radio signals that seemed to come from the direction of a sunlike star in the constellation Hercules, known as HD 164595. The signal conceivably fits the profile for an intentional transmission from an extraterrestrial source – but it could also be a case of earthly radio interference, or a microlensing event in which the star’s gravitational field focused stray signals coming from much farther away. In any case, the blip is interesting enough to merit discussion by those who specialize in the search for extraterrestrial intelligence, or SETI – including Centauri Dreams’ Paul Gilster, who brought the case into the public eye this weekend. At least two SETI research groups are aiming to track HD 164595 tonight. The SETI Institute is using the Allen Telescope Array in northern California, while METI International is looking to the Boquete Optical SETI Observatory in Panama. Gilster reports that the signal spike was detected more than a year ago, on May 15, 2015, by the RATAN-600 radio telescope in Zelenchukskaya. That facility is in the Russian republic of Karachay-Cherkessia, not far from the Georgian border. The apparent source of the signal, HD 164595, is interesting for a couple of reasons: It’s a sunlike star, about 95 light-years away from Earth, and it’s already known to have at least one “warm Neptune” planet called HD 164595 b. “There could, of course, be other planets still undetected in this system,” Gilster says. The case has been compared to the one-time-only “Wow Signal” of 1977, or the more recent controversy over KIC 8462852, also known as “Tabby’s Star” or the alien-megastructure star. There’s been no word of a sequel to HD 164595’s blip in the more than 15 months since it was recorded. Nevertheless, Gilster says it’s due for discussion at next month’s International Astronautical Congress in Mexico. The researchers behind the detection, led by Nikolai Bursov of the Russian Academy of Sciences’ Special Astrophysical Observatory, rate HD 164595 as a good candidate for SETI investigation. “Permanent monitoring of this target is needed,” they say. “Standard SETI protocols call for confirmation of possible signals from a separate observatory. This helps ensure that the original signal didn’t arise from a technical glitch in the original observatory, and it helps rule out a hoax perpetuated by some enterprising graduate students targeting a SETI experiment. “In the past, plans for SETI follow-up observations have focused on confirmation of the original signal, seeking a repeat signal at the same frequency. That’s a critical step for confirmation – and we don’t yet have evidence that this sort of follow-up has happened for HD 164595. Vakoch was involved in follow-up observations of KIC 8462852 last year, and he plans to keep watch on Proxima Centauri as well. “This is a bit of a puzzling story, as the Russians found this signal a year ago or so, but just didn’t let others know. That’s not good policy, as what you really want is confirmation at another telescope, but… Is it real? The signal may be real, but I suspect it’s not ET. There are other possibilities for a wide-band signal such as this, and they’re caused by natural sources (or even terrestrial interference). 'Interesting' SETI Signal Detected: Noise or... Aliens? A strange signal detected by a Russian radio telescope has, once again, thrown the search for extraterrestrial intelligences into the limelight. First things first, it's probably not aliens. But astronomers have identified an "interesting" signal emanating from a not-so-distant sun-like star and the mere fact that I've mentioned aliens will have you thinking about aliens and not the other things this signal could be. I'm not saying it's aliens, OK? I really shouldn't have mentioned aliens. Anyhow, let's wind this back a bit without mentioning ET. What's actually been detected? Astronomers using the Russian RATAN-600 radio telescope have recorded "a strong signal in the direction of HD164595," according to Centauri Dreams' Paul Gilster who has access to a document that is currently circulating behind the scenes. The research is not published yet, but according to Gilster, the signal will be discussed during a SETI meeting at the 67th International Astronautical Congress (IAC) in Guadalajara, Mexico, in September. The signal in question appears to be a radio burst with a frequency of 11 GHz that was detected by the observatory on May 15, 2015, coming from HD164595, which is located 95 light-years away and is known to possess one exoplanet. This exoplanet is likely "Neptune-like," approximately 4% the mass of Jupiter, with a 40 day orbit. Though this planet is very un-habitable for life as we know it (as it's very close to its star), there could be other undiscovered planets in the system. But the interesting thing is that HD164595 is very sun-like, only a little older. The 6.3 billion year-old star is 99% the size of the sun and contains an almost identical chemical makeup. When looking for habitable worlds, it helps to find a star that has similar qualities to our sun as it's the only star known to have a planet orbiting that's packed with life. So it becomes really interesting when a signal with few natural explanations is detected and, according to astronomer Nick Suntzeff of Texas A&M University in an interview with Ars Technica, a radio signal at this frequency is, well, "strange." "If this were a real astronomical source, it would be rather strange," said Suntzeff, adding that his guess would be that the signal is actually terrestrial and may be a 11 GHz burst from a military source. However, there's no known program that would be using such a frequency. The upshot is that little is so far known about this event and we'll have to wait until SETI astronomers can deduce what may have caused it. But for now, an intelligent extraterrestrial civilization blasting radio transmissions into space is a very slight possibility... though the thought is intriguing. Gilster points out that for this to be a SETI signal, the hypothetical civilization would need to be a "Kardashev Type II civilization" if it's blasting radio in all directions (an omnidirectional radio beacon) to get cosmic attention. But if they were aiming a narrow beam signal directly at Earth, which requires far less energy, they could be a Type I civilization. As a comparison, a Type I civilization has evolved with the technological ability to harness all the energy that reached their planet from their star; a Type II civilization is much more advanced, with the ability of harnessing all of the energy from their star. In the latter case, this could be achieved using a Dyson sphere or swarm. But what are the other possibilities, without pulling the alien card? First, it could just be noise; just an errant signal bouncing between Earth and nearby satellites -- like some kind of weird military signal, as suggested by Suntzeff. Also, astronomers familiar with the signal are considering the possibility of a microlensing event -- a distant radio source may have been momentarily amplified by HD164595 through the warping of spacetime, creating a cosmic lens, making the radio signal look like a suspect radio burst. But it seems the astronomy community is taking this lead seriously and the SETI Institute's Allen Telescope Array, an array of 42 radio antennae in California, have been pointed at the star in the hope of replicating the RATAN-600 observation. Nobody, so far, is saying this signal is aliens, we have a long (long!) way to go until we reach that conclusion, but we certainly need more radio telescopes pointing at HD164595 just in case the 11 GHz signal isn't a one-off. This is definitely an "interesting" signal. News of a possible extra-terrestrial signal detection sent social media into a frenzy this week, but scientists remain skeptical that the signal picked up by a Russian radio telescope actually indicates alien life. Paul Gilster reported on Saturday of a "strong signal" from the direction of HD164595, a star about 95 light years away from Earth in the constellation Hercules, on his respected deep space exploration blog. The signal was actually picked up in May of 2015 by the RATAN-600 radio telescope in Zelenchukskaya, Russia, according to Gilster. But it wasn't until last week that researchers circulated a paper about the signal. "No one is claiming that this is the work of an extraterrestrial civilization, but it is certainly worth further study," Gilster wrote for Centauri Dreams. Based on the strength of the signal, "researchers say that if it came from an isotropic beacon, it would be of a power possible only for a Kardashev Type II civilization," Gilster noted, referring to a type of beacon that transmits in all directions, with the intent, in theory, of making contact with alien civilizations. The Kardashev scale measures how technologically advanced a civilization is, and Kardashev Type II ranking would indicate the civilization is more advanced than our own. News of the promising signal sent social media into a tizzy. The discovery is scheduled to be discussed at a meeting during the 67th International Astronautical Congress (IAC) in Guadalajara, Mexico, on Sept. 27, Gilster added. Seth Shostak, a senior astronomer at the SETI (Search for Extraterrestrial Intelligence) Institute in Mountain View, California, told ABC News today that the institute was investigating the signal with its Allen Telescope Array in northern California, and had swung it in the direction of HD164595 on Aug. 28 but did not detect any signal. Shostak said he has no idea why it is only being reported on now. "Total supposition, but it could be they may have thought they just saw it once so they won't get too excited. That's me guessing," Shostak said. Shostak added on the institute's website that it was unusual that this kind of discovery would not be shared immediately with the scientific community. "One particularly noteworthy thing about this discovery is the fact that the signal was apparently observed in May, 2015 (it seems that this was the only time in 39 tries that they saw this signal). The discoverers didn’t alert the SETI community to this find until now, which is not as expected," Shostak wrote. "According to both practice and protocol, if a signal seems to be of deliberate and extraterrestrial origin, one of the first things to do is to get others to attempt confirming observations. That was not done in this case." Shostak said that the institute is still looking into the signal, but that he does not think it is a significant discovery. 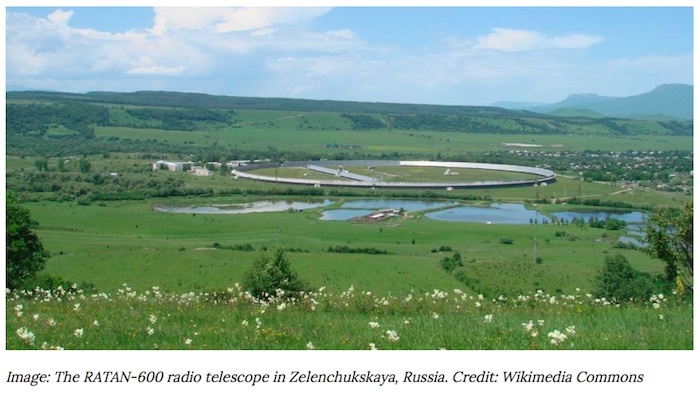 "We looked again at the source last night using our antennas, the Allen Telescope Array, and nothing," Shostak told ABC News. "The Russians themselves looked 39 times and only saw it once." Shostak added that there is a long list of other possibilities that could have caused the signal. "It could have been a military or a commercial aircraft with radar," Shostak said, "or telecommunication satellites. The laundry list for things that could fool you is not very short." "I think the fact that we didn't find it last night has me convinced that this is not a significant discovery," Shostak said. "If you find the cure for cancer but you only cure one patient, then you would not say you have found the cure for cancer."